What it takes to be a teacher is exactly what you’ll learn from today’s guest, Adam Bergman, who changed careers from marketing to become a middle school math teacher – and he couldn’t be happier! He talks about a typical day for a teacher, becoming a teacher, the skills needed to be a teacher and shares great teaching career advice from the perspective of a public school teacher. In today’s career videos, Mr. Bergman, as he’s known by his students, explains that classroom management skills are likely the most challenging part of what it takes to be a teacher. A good teacher needs to have a real grasp of the subject he or she is teaching plus great communication skills, people skills, and the ability to be organized, think fast, and make great presentations that can engage students. Mr. Bergman walks us through a typical day for a teacher from lesson planning, teaching and providing extra help to students to meeting with faculty, administration and parents. In these teaching career advice videos, we mention an important resource: the National Education Association website. The NEA site shows what it takes to be a teacher in your state plus salary info and current job openings. To teach in public school, most states will require you to have state accreditation and a Bachelor’s degree. Careers Out There Host Marc Luber: Hey everyone welcome to Careers Out There. I’m your host Marc Luber and we’re helping you find a career that fits you. Today we’re looking at public school teaching careers and our guest is 8th grade math teacher Adam Bergman of suburban Chicago. He’s gonna tell us all the behind-the-scenes info that you want to know about teaching careers, so stick around. [Theme song] OK, we’re back. Adam, welcome to Careers Out There. Middle School Math Teacher Adam Bergman: Hi, thanks for having me. Host Marc Luber: Definitely, thanks for being here. So we’ve all had teachers before because we all went to school. We all know what goes on in the classroom because we sat there and watched it happen, but we don’t really know what goes on behind the scenes. So tell us what it is as a whole that you do as a public school teacher. 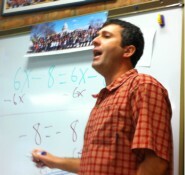 Math Teacher Adam Bergman: Well a lot goes into it. A lot goes into the planning behind any particular lesson. So you’ll get there in the morning – you might have some meetings with other teachers but you’ll get to your classroom, you’ll probably already have your lessons prepared so you just get ready any handouts, worksheets, that kind of thing. And as the kids come in you’ll do you thing. If you plan well, your thing will go very well. And throughout that day you’re gonna be meeting with individual students, you’re gonna have other meetings, possibly with some of your co-workers or perhaps your team – like I’m on the 8th grade team – so I’m gonna have some meetings with the 8th grade team. I might have some meetings with the Math Department as well. After school, you’ll stick around. You may have some kids who want to come in for a little extra help and then your day at school could be over. There might be a district meeting or a faculty meeting you’ll need to go to every now and then, but otherwise your day is over and then, depending on how you do your lessons plans, back to lesson planning. Luber: So go back to – you were saying that you have an 8th grade team meeting. Is that where you’re a math teacher – is that where you’re sitting down with the social studies teacher and all the other teachers and you’re putting your heads together to say, “how’s Jonny doing? How’s Barbie doing?” That kind of thing? Adam: Exactly. We’ll get together once, twice, three times a week to talk about the individual kids, see how they’re doing in their classes and if they’re not doing well we’ll come out with a plan on how to help that individual do better in his classes. We’re also gonna have some meetings where someone’s gonna come in and teach us about technology or we’re gonna have the principal come in and talk to us about a topic in the school. Perhaps some times we’ll meet with social workers to develop a plan for Jonny. It could be Jonny’s having a tough time in class, or Jonny’s getting bulled on the playground. Luber: And then is there often interaction with the parents to see what’s going on at home that might be affecting Jonny? Luber: So tell me this – you were mentioning the lesson plans you have to work on. Since you’re a public school, how much of the lesson plans are dictated by the state? By the government? And how much of it is you selecting what we’re gonna do today or what even the book is gonna be for class? Adam: Sure. Well the state has goals and as a school you want to hit the goals the state lays out for you. The school also has goals. So you want to be sure you hit the goals that the district lays out for you, which will encompass those state goals as well. So there are certain goals as a math teacher that I need to impress in all of my classes. They’ll be expecting that at the high school when those students graduate to high school. Those high school math teachers will be expecting those students to know what is listed in our goals. But there’s also some time to go above and beyond the goals and you get to tweak it and present it how you think will be most beneficial. So it’s a little bit of both – there’s a medium between the two. But I feel like there is lots of room for artistic lesson planning. Adam: For artistic freedom in lesson planning. Luber: And that’s gotta help make it a more fun job. Adam: For you AND for the students! Absolutely. Luber: Very good point. So, since teaching is such a serious job, especially with students that are of the age you’re teaching, you’re really in an opportunity and a position to kind of be molding young minds. So it’s a very serious and important job. What would you say – how does that impact your career and the way you approach it every day? And do you keep that in mind – of everything you do or say can really have a huge impact on the development of these people. Adam: Absolutely. You’re a role model at every minute of that day. So you do have to keep that in mind, whether you’re in the classroom, outside the classroom, walking down the hall. The way you communicate with the students outside of the classroom, or the other co-workers – so absolutely – you are a role model. You keep that in mind. But you know who you are – just be yourself – and if you’ve got what it takes to become a teacher and those who watch you probably will, then being yourself is really all you can do. Luber: And the kids can tell when you’re being yourself. Adam: Absolutely. They want you to be yourself. And it is a serious job – and you should take your students very seriously. Don’t take yourself too seriously out there, but definitely take the students seriously. Luber: Then when you talk about preparing lesson plans, how do you prepare for each day? Is it a matter of going through the book and going through the questions the students had the previous day? How is it that you plan what is it gonna be talked about? Adam: Lesson planning for me has definitely evolved over the years being a math teacher. The more experience you have in the classroom, the more prepared you’ll be for lessons. You’ll know what kinds of questions to predict. But then there’s also as the day goes on, if you teach a few of the same subject – like I have some Algebra classes that get repeated – I’m gonna know in the afternoon what types of questions I was hearing in the morning. So sometimes in those classes I can cut them off and present those questions before they even come up. So you kind of tweak it as you go along. You do that as well in the history of your teaching. Plus there’s more technology involved. We used to write down our lesson plans all the time. Now a lot of us are typing out their lessons plans into the laptop. I am now in these last couple years our lesson plans are going directly into my Promethean Board software. That’s a smart board, which is actually in the classroom – over there you can see it in the upper left hand corner. Luber: Oh that’s great! Yeah! Adam: And what I do is I prepare all my lesson plans now on the Promethean Board. Whether I’m using it or not, that board is always being used at least with bullet points for what we’re doing in class. What’s nice about it – it’s all in the same place, it’s very easy for students who come to me – “oh I was absent the other day, what did we do” and I can say “not only do I have what we do right here, I can show it to you, I can print it off, I can go over it with you, I can email it to you”…..it’s very easy to find that stuff. And it’s great – sometimes you know you have a kid who says, “Mr. Bergman, this isn’t fair that it was on the test, we never went over it in class” and I would say, “Not only did we go over it in class, but I know the exact date and time we went over it!” So I gotta tell you – I love the technology. Love it. Luber: That’s really cool. Now who provides the technology? Is that given to you by the district? Does every teacher get the same thing or does everyone fight over resources? How does that come to be? How do you get the technology? Adam: Yes, yes, yes and yes. The district gives it to us and I’d like to say every teacher gets the same thing. I know they’re working at that. These Promethean Boards started off in certain subjects and they’re being expanded so the goal eventually is that everybody will have one. Then they’ll train us to use them and as that technology improves, hopefully we will get upgraded as well. But it is a district decision and it’s district spending so of course some schools don’t have that Promethean Board or even a smart board yet. Luber: And that leads to my next question, which is you are in a particularly affluent community. So it’s a school district that probably has a nice amount of money. How would you compare your experience to if you were in the inner city at a poor neighborhood or if you were in an isolated rural neighborhood. How would your teaching experience be different and even the technology that you’re getting? Both of those factors? Adam: Sure. It would be different depending on the different schools you’re at. Some of the city schools have excellent funding and have some of the same technology. Perhaps even better than us. But some don’t. So depending on where you’re at, you might not have a Promethean Board. You might not even have an overhead project to put an overhead on. So you might be with a blackboard or a whiteboard – you might not even have that. So you’re gonna need to adjust and figure out the best way to use that given what you have. When I first started out, all we had was blackboard and chalk. Nothing else. Eventually I got an overhead projector, I started using that. I learned how to use that properly. Then, every now and then, I was able to – because we eventually got computers – so I was able to borrow somebody’s overhead projector for the computer and make Powerpoint presentations. Even though they took longer to make than they did to present by a long shot, they were still so much fun to use in class – you had a remote control, you could walk around the class and work the class while the lesson was happening and work it from different angles in the room so you’re moving around the room and not only at the front. So you’re gonna need to adjust based on what you are given. Some of my friends who teach in the inner city will sometimes say “hey, at least you’ve got a high attendance rate and your students have books – my students are only coming 75% of the time” or “my students don’t even have books – I have to lend them books” or “I’ve gotta lend them materials”. So it is different everywhere you go. And depending on what you have, you’re gonna do the best at it and if your district is giving you lemons, then you’ve gotta make lemonade. Luber: That’s great. Tell us this – what about – you have experience having worked in a private school – can you compare quickly the private school to public school situation? Adam: I worked my first year in private school in the city and then I got my second job, which is where I’m at now, and there’s a big difference of support, number1. Even though I really enjoyed working at that school, I had very little support at all. They never did any conferences, they never sent us for continuing education, I didn’t even have somebody I could go to with questions about the curriculum. I had to figure everything out myself. That was very much teaching on my own. Very rarely if ever did anybody ever come into my classroom. Here, it’s completely different. Our administrators will serve us, they’ll give us feedback, we work together closely with our team but also the other math teachers. If I have a question I’ve got people in my building for the district that I can contact and say, “hey – how do you teach factoring? What’s the best way that you’re teaching factoring?” So the resources and the support are a big difference. But I still loved the private school and the private school feeling as well. Now I happen to be at a public school that very much feels like a private school. So I feel like now I’m kind of in the best of both worlds. Luber: Yeah, that’s a good situation! Walk us through a typical day. Adam: OK, well I’ll arrive in the morning anywhere from 20 minutes before school starts to a couple hours before school starts, depending on what I need to get done to prepare for class. But most of you guys who are listening – in your first couple of years, you’ll be getting there an hour or 2 early because the first couple years teachers do – simply because the learning curve – and it’s the beginning of their career and there’s a lot that they’ll have to do to figure it out in the beginning. But it’s fun and you’re learning and the more you do at the beginning, the less you do as the years go on. The students will come to you, you’ll teach, I teach 6 of the 9 periods of the day. 3 of the periods are free. 1 of them is for lunch and that really is free. The other 2 are for planning. Certain days of the week we have meetings during those planning periods. If you’re not meeting during the planning periods, you’re planning or you’re grading papers or you’re having an impromptu meeting with other teachers that you work with, and to talk about Jonny, talk about your curriculum, maybe talk about a cross-curricular activity, or you’re meeting with an administrator for a scheduled meeting or whatever it is that you’re doing. The day ends, maybe you’re gonna have kids come in who need some help, maybe you’re a coach, maybe you gotta go coach or you gotta go to a game or you have an after school activity. Then the day is over, you go home, you hit the gym, you come do some lesson plans, eat some dinner and talk about the good times when you get home because you’ve got a career that you like! Luber: That’s a good day! That’s perfect. What about the most rewarding aspect? I would imagine it’s gotta be watching these kids grow and just develop over the year. Adam: Absolutely. You’ll see them grow over the month. And then as those months go on, you’ll see them grow a lot over the year. And a lot happens in middle school years. A lot of growing happens in middle school years – particularly in the 7th and 8th grade. Not to mention the gift that when they come back to visit you, and at our school they do a lot when they’re in high school and college, and you see them all grown up. That’s an awesome – and also really interesting – but it is rewarding to work with the people here – we happen to have a good community – really good co-workers, the kids are awesome and it’s always rewarding when you have a kid who’s having a really difficult time with the material and you’re able to make that sell where you’re turning them around and you’re getting them motivated to do the work and they’re finally understanding and they’re feeling good about themselves, they’re walking off thanking you, high-fiving you, that kind of thing – that’s good stuff! Luber: Yeah, that’s awesome – definitely! Adam: It makes it worth it! Luber: Yup. What about the most challenging aspect? What are the things where you’d weed people out and say if you can’t handle this, you can’t be a teacher? Adam: Well, the most challenging aspect certainly for 98% of teachers who are starting out, 2 things that I hear about all the time – and as a mentor for first to 4 year teachers – and I have been for 6 years – we always talk about these 2 things: Number 1, classroom management. Classroom management is huge. It’s intimidating in the beginning and you’re learning different strategies that will work, different strategies that will not work and some of the challenging aspects are gonna be classroom management. But you’ll get there. You will get there. And the other big item is making sure that you can get along with the other staff. It’s always gonna be – a large percentage – probably 98% of the other staff members are great, easy to get along with. The 2% that aren’t easy to get along with – you need to make it your point to figure out a way to get along with them. That is your job because it is a problem for people who are starting out sometimes – you can’t let those people get to you – don’t take it personally. I think they would say fight them with kindness. Luber: Yes. That’s always useful. Adam: Kill them with kindness. Luber: So that leads well to the next question then: what are the right personality and skill sets for this job? It sounds like people management, people skills and communication skills are the most important things. Is that accurate? Adam: People skills are huge in this field. You need to be able to communicate to your boss, to the parents of your students, to your students, to your co-workers, communication is key. And you gotta, as we said earlier, you’ve gotta listen and listen effectively, hear what others are saying, you’ve gotta be organized, you’ve gotta be able to present well, you’ve gotta be able to think on your feet, be a fast thinker. They’re gonna be shooting out questions at you left and right in the classroom – you’re not necessarily gonna know them all and no one expects you to know them all. There’s not a problem saying, “you know what, let me Google that and I’ll do that right now and I’ll get back to you now” or “let me think about that and get back to you tomorrow”. Don’t be pulling out some answer out of your rear end. It’s OK for you, especially when you’re first starting out, to not know something. Be prepared for that. Other things, you gotta know your subject area. You’ve definitely gotta know your subject area. If you’re gonna go into history, know your history. If you’re gonna be teaching art, know your art. If you’re doing math, know your math. I’ve had student teachers come to me and they’ve had all the skills – they’re gonna be great teachers one day – but they didn’t know the skill that they were teaching – they didn’t know the basics of Algebra that they were teaching and they were getting flustered in the classroom because presenting it was difficult because they were having questions themselves, so questions to kids liked their personality but there was all this stress and pressure in the classroom because the teacher wasn’t on top of the material. Know your material. Luber: Very good advice. So since you’re a math teacher, I’ve gotta show you this trick that Sofia, my friend in 3rd grade showed me. It’s the multiplications of 9. I don’t know if you teach the kids this or they’re way past multiplication at this point. If you take 9 times 3, you take your hands, you take your 3rd finger, you put it down, then you’ve got 9 times 3 is 27 so you have 2 fingers on the left of your 3rd finger and then you have 7 on the right and it goes all the way down. If you do 9 times 4, 9 times 5, it goes all the way across! It’s pretty amazing! Adam: I’ll tell ya – we’re not teaching that in the 8th grade anymore! But I’ve seen kids during tests who obviously learned that when they were younger – and they’re in the middle of the test and I see them doing this with their fingers. And I tell the kids no flashing gang signs in class please! Luber: So tell us the types of majors and educational backgrounds that people need. There’s no specific major that you need to go through to become a teacher, is there? Adam: Well if you’re lucky enough to know your freshman year of college that you want to major in education, that’s great – and that’s gonna be extremely helpful, obviously. But, for example, I graduated – and I changed my major senior year to marketing, graduated, worked for a year and THEN decided to become a teacher. So when I went to grad school, I got my Master’s in education while working on my degree for mathematics. But I never studied any education in undergrad and it really didn’t set me back but I had an extra year of school – but I also got my Master’s, which I would have needed at some point to get anyway – so it’s great to study education but, you know, if you’re like “Oh, I’m a junior already – it’s too late” – NO IT’S NOT – in fact it’s NEVER too late, people. You can be a history major or a math major and when you graduate say, “hey – I’d like to get into teaching”. If you go to your college counselor, find out what the requirements are to get your teaching certificate. They might be less than you think – and you can start teaching sooner than you think – and while you’re a teacher, take your night classes to work on your Master’s degree – because most districts will want you to become a Master at some point and get that degree. But they don’t necessarily expect you to have it right off the bat. Luber: Interesting. Alright – you guys – I’m gonna put a link on the site too to the National Education Association website. That site tells you what each state requires to become a teacher as far as degrees, certifications and what the salaries are gonna be in your state. It is a state-by-state thing, so every state is different. And sometimes you can get licensed and registered in 1 state- certified in one state to be a teacher – and then move to a new city in a new state at some point – and it’s NOT gonna transfer over! So you might have to get recertified in the new state – so you definitely want to check out the National Education Association website. We’ll put that link there for you. So basically, someone can do a 4-5 year undergrad program to become a teacher OR they decide after and then, like you said, they can go get their Master’s – or – I spoke to the Illinois State Board of Education the other day just to hear what they said about Illinois – and they said there’s an Alternative Route Certification – that’s what they call it there. Alternative Route Certification – so if you already finished college and you’re doing something else – you’re changing careers into teaching, with 5-plus years of work experience in the same focus as your college degree, you can do an Alternative Route Certification where you would do a summer school program that’s very intensive, then start teaching in the fall and then at night for 1-2 years continue to go to school so that you can get your full certification. Adam: That’s great – so they get you in the classroom quicker. I like that a lot. I had a friend who was a lawyer and he decided to become a teacher – he didn’t do that program – he had to go to school for a longer time but he got a great teaching job and is loving it. Luber: Great. I guess this system is for if you have an expertise in a specific area. Obviously, you’re not gonna be teaching law to a junior high student, so if you’re not an expert in a certain area, maybe you majored in history in college and became a lawyer, then maybe you can be a history teacher. Adam: Exactly. And he was – he’s a history guy who went to law school who was a lawyer and then he ended up teaching history. Luber: Cool – excellent! So what about money? You don’t go into teaching to get rich – and it’s different state by state, but can you give an idea of what a first year teacher – what someone could think to get right out of college? Adam: It’s been a while since I was a first year teacher so I’m not really sure what the opening number is but it’s gotta be somewhere at this point in the mid-$30,000s. The money is not horrible – once you get started, you can get a pay increase based on your Master’s degree and then your number of graduate hours and of course your number of years – so as you move up the ladder, you will make more money. The increase from year to year is approximately 4%. So the more your base becomes because of years and because of graduate hours, the more that 4% will keep on adding. So after you’ve taught for a while, the money does get better. Better of course, but I don’t hear many people say “I’m gonna go into teaching for the money” – so you know what you’re getting into first. Now – due to the fact that you have summers off, there could be more income in the summer – if you decide to teach summer school or to do something else. Luber: And coaches right – if someone is coaching after school? Adam: Exactly – extra money, after school activities, private tutoring during your own time can make you some extra money. So there are other things that you can do to help level that playing field. The money in Illinois, city schools included, is not horrible. I think it’s pretty good. It’s not on par with lawyers, doctors and business people. Luber: OK. Give us an action plan. If somebody wants to get into this career path – they want to be a public school teacher, whether they’re in school or already done, give us an action plan – what could someone be doing? Adam: Well while you’re talking with your college counselor of your choice to find out what you need to do on that end, get in with a school. It could be the school you went to, a school in your neighborhood and sub. Call the principal and see if there’s a way you could volunteer 1 or 2 days a week or a couple hours a week. Get in with the coaching. Get into some free after school tutoring that you can offer. Do something where you’re gonna get to know people who work at that school – some of the co-workers, get that foot in the door, be proactive, because I’ll tell ya – if you’re good at what you do, and the staff knows it, when it comes time for a hire, whether it’s in the school or even in that district, they’re gonna go out of their way to talk about you. They’re gonna say “we need that person on staff”. My last couple student teachers I thought were really good. And I actually went to my principal and one of the hiring people in the district and I said, “this is somebody you do not want to lose – you do not want to lose this person – and if we don’t have a job for them, find them a job in the district because somebody’s going to get that job.” We ended up hiring both of them. Luber: Both of them! So essentially it’s networking! Like any career path, you’ve gotta network. Adam: And you’ve gotta be there for people to see your skills. Luber: That is red magic marker territory! Networking! We always want everyone to remember that. Get out your red magic markers and write down networking! You’ve gotta do it! Luber: Tell us your background. What got you into teaching? Adam: Well I had a long path into teaching. I was a camp counselor in high school and college and years later I was asked to chaperone a trip to Six Flags/Great America with a friend of mine through our whole camp contacts. And we thought it would be fun – we went and I was actually asked after that trip if I’d be interested in teaching Sunday school. My first thought was no way! But then I took her phone number and I thought about it. When I called this woman back who was the principal of the Sunday school and I said, “Sure – I don’t have any experience though” and she said, “we’ll train you”. They never really did train me, but when I got into that classroom, I had a good time. And every Sunday I would be there – didn’t matter what I was doing Saturday night. I would wake up early Sunday, go to the Sunday school and have myself a really good time. This got the cogs in my mind thinking “maybe I should be doing this as a job”. I went to a career counselor who said “pick something you like and try to make a career of it”. There weren’t many careers I thought I could really do of things that I like. I didn’t think that going to movies I could make a career out of it. Ebert did. Siskel did. But I thought that would be more difficult. Well this teaching idea really started coming to my mind – it was hard at the beginning – I didn’t know any other guys my age who had become teachers – and it seemed a little bit off when I told people about it. People would be like, “oh really?” So it was tough back then! But I decided you know what, this is what I want to do and I talked to my boss at the time and I talked to Northwestern and I decided to do it and I started school a couple months later and it still took a while. It took maybe a year or 2 of teaching to realize, “you know what, I did it – this was the right decision – I made the right decision and here I am.” And then I ran with it. Luber: That’s awesome! Good job – good move. So wrap us up on a high note with some keys to success for this path. Adam: Well if you think that you can have the people skills to talk to the kids in front of the classroom to help out with their work, to be able to work with your other co-workers, administrators, people in the community – that is parents, if you’re high-energy, if you think you can put together some entertaining, thoughtful, engaging lesson plans, if you think you’ve got what it takes to put in a long week – and then sit back on the weekend and enjoy and think about what happened and reflect upon it, know that you’re gonna have a little fun in your summer and you want a job that is really rewarding, fulfilling and really is a lot of fun, get that ball rolling and become a teacher! Luber: Excellent. That is great, great advice! Alright you guys, leave your feedback in the Comments section. If you have questions for us, Adam will be here to help out. And let us know – what did we cover well? What did we not cover well enough? What do you want to know more about? We definitely want to hear your feedback in the Comments. So that would be great. We appreciate your watching. Adam – thank you for joining us. Luber: Alright you guys, I’m Marc Luber. Thanks again for watching. Look forward to seeing you again soon. Take care.